Oh dear.... I am getting tired of having to report on the dismal situation of Venezuelan jails. Now, even after a year with a special minister for jails, things do not seem to be improving. Of course, for Iris Varela to have any chance of success at her job would require a true political will to not only spend for building jails where a minimum amount of humanity exists, but also the will to force the judicial power to do its job and stop processing only those who can afford to go to trial, and blocking the Nazional Guard mafia allied to the warden ones, which is the only reason why so many weapons and drugs find their way inside jails. But the regime has other priorities for its cash...... corruption surely trumps humanity. The regime as usual blames anyone but its incompetence, with a special accusation for the media. I am not putting a link, just the Google search for your enjoyment. However we must underline the wisdom of Iris Varela: to solve La Planta problem, it is enough to close it and put its inmates in overcrowded jails elsewhere. At least they will be far from Caracas and these pesky media. Elides Rojas suggests that a liberated La Planta should be transformed into the museum of the bolibanana revolution, a satiric article not to be missed. 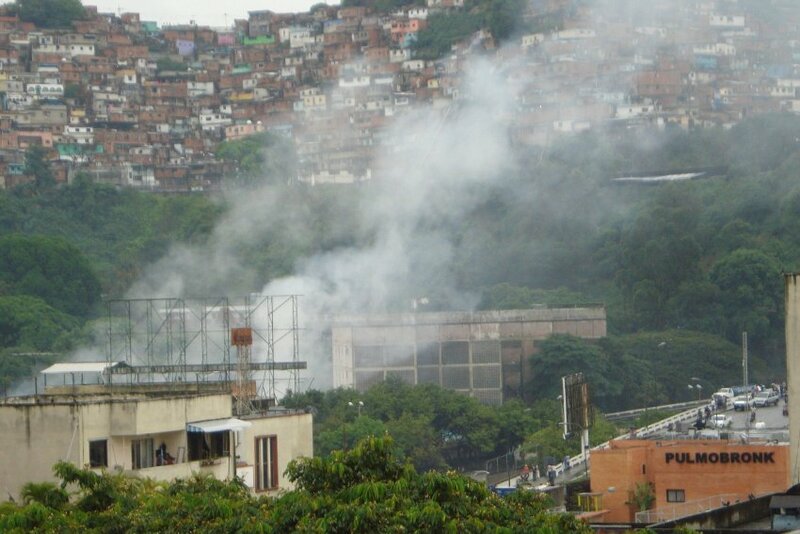 By the way, to make sure I am not accused of sensationalism by Iris, this picture is sent to me by a reader that lives downtown Caracas and could see from her window the spectacle of tear gas in La Planta yesterday. 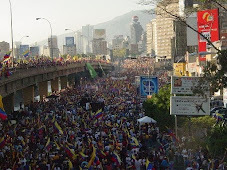 By the way, Caracas main thoroughfare had to be closed for a whiel because of shooting. No further comment needed. 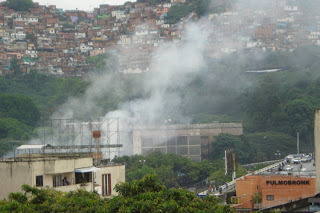 "this picture is sent to me by a reader that lives downtown Caracas and could see from her window the spectacle of tear gas in La Planta yesterday." Iris Varela: "And who are you going to believe, me or your own eyes!?" Well, Iris Varela already makes it hard to beleive she exists. It is a pity they will close that jail. Could be a great place to concentrate ( as in concentration camp) the Chavista honchos in due course in order to let them practice "el coliseo". Imagine Cabello chopping the head of Maduro? Priceless! My apologies, I am a radical. The reader informs this tonight that her building has been shot several times and that next door someone got a bullet wound.